Netflix Canada is being a bum and has put up a notice that Sesame Street will no longer be available in a few days time. And the first thought in my head when I read this notice? Frick! Now how am I going to get any work done in the morning? That is a bad mommy moment if I ever did see one. Yes, I put Laney in front of the TV in the mornings. I'm that mom who lets the TV entertain my child. In my defence, however, I would like to add that I always make sure she has a clean, dry diaper on, a sippy cup full of juice (half watered down so don't judge me about that too hehehe), her binkie and a nutritious morning snack while she watches Sesame Street. This has got to count for something because if you remember with Logan, he was totally addicted to Sponge Bob. ACK! And he turned out fine right? Collect the laundry without little hands pulling all the clothes out of the basket. Start a load of laundry without a little girl playing peek a boo through the washing machine door. To fold the laundry that was left in the dryer the day before without Lane "helping" by throwing all the clothes on the floor and bunching them up like they are "folded". To maybe run a duster through the house without little hands pulling the feathers out of the feather duster. To scrub a toilet or two without a little girl smashing the toilet brush into the toilet with such force that the entire bathroom is now coated with blue coloured icky splash water. To wash a few things without Laney grabbing the soapy cloth and trying to wash the cat with it. Lane's attention span is only about 20 minutes at best, but you'd be amazed at how much I can get done in 20 minutes when I'm motivated. So boo to Netflix (or more specifically, the company who won't sign a contract with Netflix) for taking Sesame Street off their streaming list. If my house starts looking like hoarders live here in the dirt and grime and piles of clutter, I'm coming after you Elmo. You are the only thing that entertains my kid long enough for me to get any work done. Therefore it's your fault for not being there when I need you. I'll get you. I might even use your cute furry red hide as a mop. That would keep Lane entertained enough to make this house livable again wouldn't it? Or traumatise her for life? Either way I will have a clean house - so WIN! Oh - and Elmo - could you teach Lane how to go to the potty in the remaining few days you're on Netflix. K thanks. 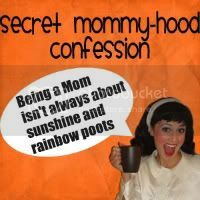 Want to check out the other Secret Mommyhood Confessions, or post up your own. Check em out at All Work and No Play Makes Mommy Go Something Something. Why are they getting rid of Seame Street? That's so weird...and sad. I don't know about Canada, but in the US, "Sesame Street" is on public channels. While I used to hear some Mom's exclaim in horror that I used to park my child in front of the TV on Saturday mornings, not only did it give me a break to get things done as a single working parent, but I looked up many studies on the internet where children love repetition and routines in general and find them comforting. I had a few educational tapes like "Barney", "Sesame Street" and "Blue's Clues" that I would pop in the VCR (my son is now 18) and he loved watching them over and over and he loved watching them over and ove0r. At one point he would recite every word and even other movies we would watch over and over. When he decided he wanted to get into acting, it seemed effortless for him to be able to learn and recite lines.